The modular, plugin-based design allows one to extend JMeter to support almost any protocol. This post looks at how to invoke OS commands and 3rd-party programs on local and remote machines. I refer to “local” as the host where JMeter is running, and “remote” as a different host where the application/web server or database lives. Command - An OS command or program to execute. If the target exists in PATH, just the command name will be enough. If not, you’ll need to provide the full path. Working Directory - The command will be executed in the directory specified. If omitted, the execution context will be JMeter’s base directory (usually JMeter’s “bin” folder - where JMeter startup scripts live). Command Parameters - Any command-line arguments, if needed. Each argument should go on the separate line. 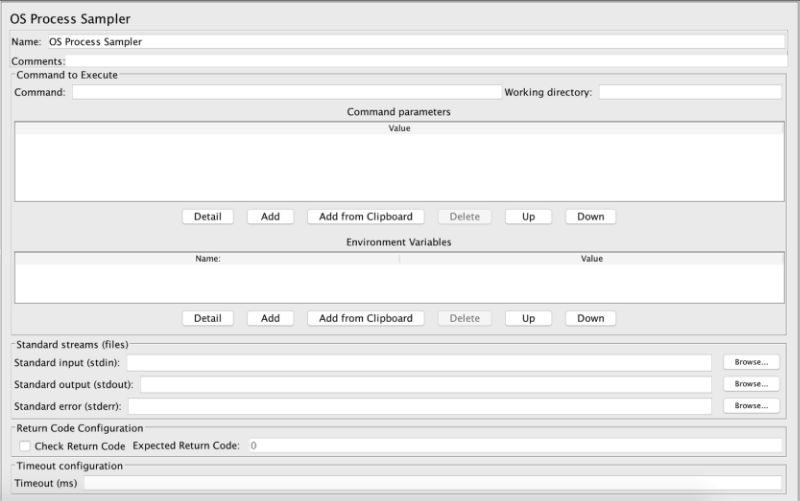 Environment Variables - If your command relies on specific set environment variables, you can provide keys and values here. Standard Input - If your command expects the console input, the default stdin (standard input) can be overridden with a file using this parameter. Standard Output - If set, the output of your command will go to the file specified. If not, the output will be returned as a Sample Result. Standard Error - Same as above but for overriding the stderr (standard error) output. Check Return Code & Expected Return Code - These parameters work similarly to the Response Assertion on the Status Code. 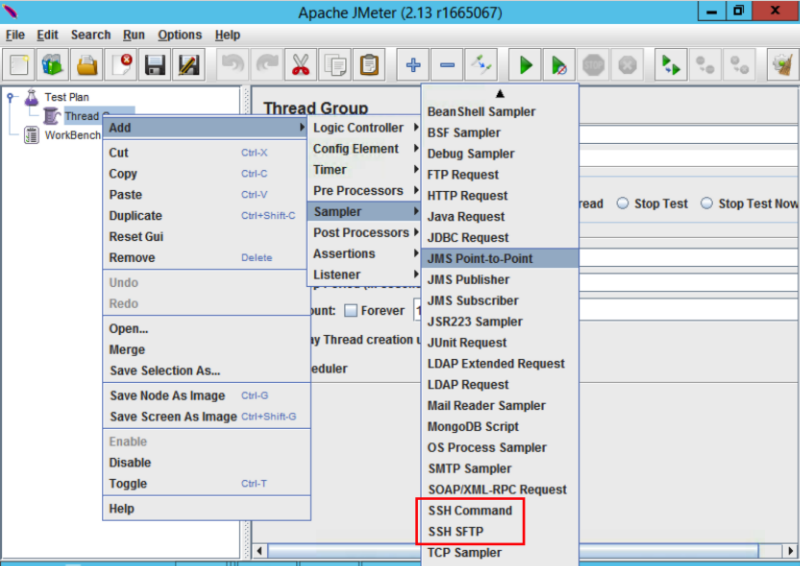 If the check for the response code is enabled, JMeter will compare the actual response code with the Expected Return Code and fail the sampler in case of a mismatch. For Windows, the exit code for a program is stored in the %ERRORLEVEL% environment variable. For Linux and MacOSX, the exit code can be accessed as $?. Timeout The time in milliseconds for the command’s completion. If exceeded, JMeter will interrupt the process and fail the sampler. In Windows Firewall, open port 5985 if you use HTTP and 5986 if you use HTTPS. This example stops the Windows Notepad process on a remote machine. Use the plink program (it can be downloaded from the same page as the popular PuTTY SSH and Telnet client) from the OS Process Sampler. Use the JMeter SSH Sampler plugin. Again, since running the “plink” program via the OS Process Sampler is quite easy, let’s see how *nix hosts can be controlled with the SSH Sampler. Download ApacheJMeter_ssh-x.x.x.jar and jsch-x.x.x.jar from the SSH Sampler Releases page. Drop Apache_JMeter_ssh-x.x.x.jar to /lib/ext folder of your JMeter installation. Drop jsch-x.x.x.jar to /lib folder of your JMeter installation. You should see 2 new Samplers: SSH Command and SSH SFTP. So it is quite enough to provide host, port, credentials or a private key file and command line, and the command will be executed on the remote Linux, Unix or MacOSX system. The image below demonstrates remote execution of JMeter on Linux from the Windows host. Blazemeter is 100% JMeter-compatible so feel free to use any of the above approaches in your tests (just don’t forget to upload any extra .jar files with your test plan). This has been an explanation on how to run commands and programs on local and remote machines right from your JMeter test. If anything is still unclear - don’t hesitate to ask your questions below.